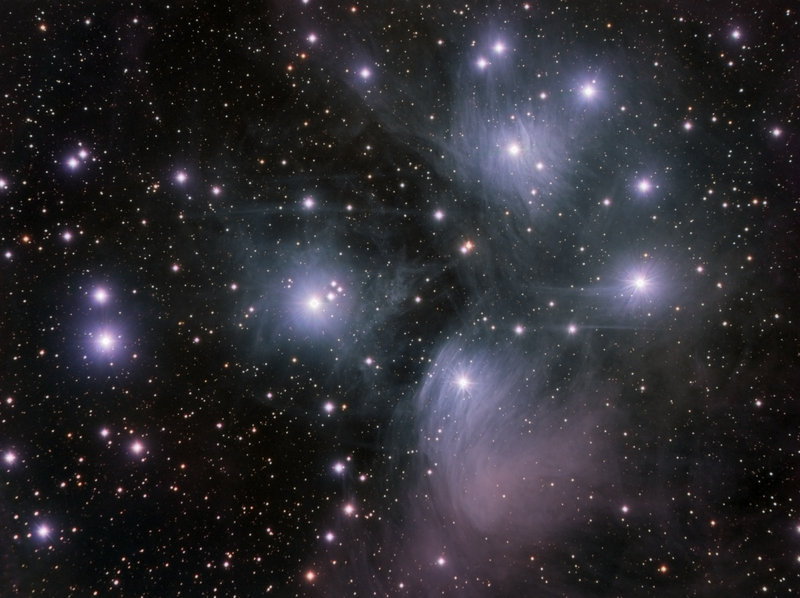 The Pleiades (also known as The Seven Sisters, Messier 45 or M45) is an open star cluster containing middle-aged, hot B-type stars located in the constellation of Taurus. It is among the nearest star clusters to Earth and is the cluster most obvious to the naked eye in the night sky. The cluster is dominated by hot blue and extremely luminous stars that have formed within the last 100 million years. Dust that forms a faint reflection nebulosity around the brightest stars was thought at first to be left over from the formation of the cluster, but is now known to be an unrelated dust cloud in the interstellar medium through which the stars are currently passing. Computer simulations have shown that the Pleiades was probably formed from a compact configuration that resembled the Orion Nebula. Astronomers estimate that the cluster will survive for about another 250 million years, after which it will disperse due to gravitational interactions with its galactic neighborhood.